The recreational opportunities listed on the webpage for the Coquille River Estuary are brought to you by wwww.clamdigging.info for the benefit of the members of the Clam Digging and Crabbing Community. The Coquille River Estuary at Bandon. Click on the image of the map to enlarge it. Coquille Bay is one of Oregon’s smaller bays ranking eleventh among the fourteen major bays, but the bay is one of the premier crabbing and fishing bays on the Oregon Coast. The bar is subject to breaking waves even in calm seas. A seasonal light and fog signal are located on the south jetty. The skipper should be experienced with the local bar conditions before attempting to cross the bar. The boater should be prepared to deal with fog and the waves generated by the prevailing afternoon winds. The Coast Guard maintains a seasonal lifeboat station in the boat basin from Memorial Day through Labor Day. Click on the Oregon State Marine Board and click on Forms Library Scroll down to Publication for download (Many publications no longer in print). Click on Coquille River Bar Hazards The interactive PDF file webpage describes the navigational hazards that boaters encounter when crossing the Coquille River Bar. Bandon Bait & Tackle is located next to the Public Boat Launch at 110 1st St Se, Bandon, OR 97411.On 4/07 Diane from Bandon Bait reports Crabbing in the bay is from Weber's crab dock is slow because of the storm water runoff. BUT yesterday one lady took 9 legal sized crabs and another took 5. However the pounding rain has put the lid back on the moment of glory. Diane fixes a mean fish and chips to go along with her clam chowder. She also books fishing trips for local river guides. (541) 347-3905 Diane rents crab rings and sell bait to catch the freshest food available. On 4/14 Tony's reports Crabbing from Webers Crabbing Dock is slow. The legal sized crabs are avoiding the freshwater dominated bay. The catch consist of small juvenile crabs. Some redtail surfperch are showing up on area beaches. The Perch Derby, registration required begins on 05/01 and is sponsored by Tony's Crab Shack, the Bites On and Basin Tackle. On 04/14 Tony's reports: the CRAB DERBY 2019 is scheduled to begin on 07/01 and run to the Cranberry Festival. The crab derby offers a chance for recreational crabbers registered In the DERBY to WIN BIG!! The Port of Bandon at the Coquille River Estuary: Tony from Tony's Crab Shack at 541 347-2875 reports on the recreational opportunities available from Coos Bay to the California Boader in the Bandon Western World. The Bandon Western World newspaper is a great source for current and future public attractions in the Bandon area. Bill's Crabbing Adventure from Webber's Crabbing Dock in Bandon. Crabbing at the Coquille River Estuary: one of Oregon's premier crabbing bays the Coquille River Estuary is one of Oregon’s smaller bays ranking eleventh among the fourteen major bays. Crabbing in Bandon usually remains productive until the bay blows out with turbid brown stained water during seasonal Fall rains. Tony's Crab Shack Annual Crab Derby. Catch a tagged crab and win the Big Bucks 100.00 dollars weekly and 1000.00 value worth of prizes from July 4th through the Cranberry Festival in September, that is if I got it right. Six crab tags have been turned in at Tony's. Tony's May surf perch derby is over now and the winners collected their prize. Pay a 5.00 entry fee, land the largest fish posted to the derby and it is winner take all. Second place is a hundred dollar gift certificate and a fifty dollar gift certificate for third place. The food Tony serves is great!, The fish Tacos umm umm are so good, I make the drive to Bandon to have lunch with my wife, Diane whenever I am in the area. Tony’s cooks crabs for 50 cents per crab and backs them for an additional 25 cents per crab. Tony rents boats in the summer and fall months. Read Tony’s all encompassing Fishing Report in the Bandon Western World newspaper or the online edition at Bandon Western World. Tony's Credo, "How To Be A Crab Ninja"
Over the years I have pretty much tried every trick in the book to catch Dungeness crabs in Bandon, Oregon. In those same years I have learned one FACT, and that’s the fact that crabbing is an art, not a science. So many factors play into catching crabs that you can never hope to hit the Holy Grail and perfect crabbing every time you go out. You can however increase your odds. The following list of tips will help you overall in your effort to catch legal Dungeness crabs. 1) Bait is important. Things that are natural to crabs seem to do better. This includes using fish carcasses, squid, clams and the like. Using these also have a downside in that seals seem to love these baits as much as the crab do. In a battle of you vs. the seal vs. your bait, YOU LOSE. So BEST tip on bait is protect it at all costs. Using a bait bag or bait box will often keep the seals at bay. It will also help to keep the crab on your bait longer. If a crab pulls off a nice piece of your bait more than likely it’ll crawl off an eat it so something to stop them from tearing off chunks will improve your odds when using crab rings. 2) Location, location, location. Crabs tend to get pushed around with the tides and also tend to settle into channels formed by those tides and river flow. If you can find a place near this your odds go up. If you want to crab where it’s best for you, such as an enclosed boat basin your odds go down. If you are crabbing and are catching at least some crab then at least you know they are there, if you are getting nothing, likely it’s time to move. I don’t know how many people I have seen crabbing in areas sheltered from the wind and far off the beaten path and whining how the damn crabs are not to be found, well DUH! 3) Crab rings aren’t for wimps. A Dungeness crab may be a dumb little sea creature but when the ground moves underneath them they have enough sense to think all hell is breaking loose and it’s time to get out of Dodge. So if you are using a crab ring and pulling real slow, YOUR crab are basically yelling “Wooooos” to you and crawling off your crab ring. Pull quickly, you will get all the rest you need AFTER you have your belly full of fresh Oregon Dungeness crab, but until then, crab like you mean it. If you can’t do this, get a trap that will at least keep them in for the most part. They are heavier and harder to pull but much less affected by pulling them up slowly. 4) Crab when crabbing is good. For every day of the year someone will tell you something about how to know when crabbing is good or bad. From salinity in the water, to months of the year that end in ‘R’ to the day after a storm, full moon, sewage spill or whatever. But if you REALLY want to know how the crabbing is doing, ask around the stores on the docks, they usually know. They can not only tell you how the crab are running but if they are full and meaty or have just molted. The staff at Tony’s Crab Shack always know what is happening since they cook many of the crab caught in Bandon. 5) Don’t be afraid to ask. Most crabbers on the docks are totally full of crap and will tell you they caught 30 crab yesterday, that’s just fishing. But they will usually help you with honest questions, like what bait are they using, or how best to throw crab rings, how to measure crabs and the like. But remember if someone asks you these questions it’s a time honored tradition to lie about your catch, you always caught 30 yesterday but today is slow. Clam Digging: Clam digging in Coquille Bay is limited to digging softshell clams. The softshell clam beds are located in the National Wildlife Refuge at Riverside Dr on the eastside of the bay above Bandon. A very limited number of littleneck and gaper clams are located in the lower bay along the south shore. Some purple varnish clams are dug from the large tidal flat on the north side fo the bay at the entrance to Bandon Marsh. Mussels are picked from the rocky structure at Face Rock. Razor clams are dug along the beach south of Face Rock. Seen live Bandon's Coast Cam. 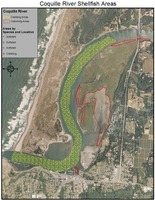 Tbone Tidal projections for the Coquille River Estuary. Tidal Projections:Click on the NOAA tidal projections for Oregon. Scroll down to the Chetco and Rogue River Estuaries and click on your area of interest. Click on the following link to view the navigational hazards for crossing the bar at the Coquille River Estuary. Oregon's Beach Monitoring Program is a part time program that occurs between Memorial Day in May and Labor Day in September. The Algae Bloom Surveillance program advises the public when a harmful algae bloom has been detected in a lake or river. Not all blooms are harmful, but some species of algae, such as cyanobacteria or blue-green algae, can produce toxins that can cause serious illness in pets, livestock, wildlife and humans. Fishing in the ocean in along Coquille Bank is excellent for rockfish and salmon on the pinnacles located approximately a mile west of the entrance to Coquille Bay and at Coquille Rock located approximately 1½ of a mile west to the entrance of Coquille Bay. Fishing for rockfish is excellent at Five Foot Rock and Wash Rock, both of which are located south of Coquille Bay. Fishing for Rockfish and Chinook salmon along Whiskey Run Reef located southwest of Cape Arago is excellent. Chinook salmon begin returning to Coquille Bay between the last week of August and the first week of September peaking as early as the last of September but usually in early October and running through October. The catch rate for Chinook averages 1824 fish per year with a high percentage of 4 year old fish followed by 5 and 3 year old fish. The best fishing for newly arriving fall Chinook salmon occurs in the lower bay during the incoming tide of the major tidal exchange of spring tides or neap tides especially when the incoming tide coincides with sunrise or sunset. The next most productive fishing period occurs at sunrise or sunset during the incoming tide of the minor tidal exchange in the daily tidal cycle. Daybreak is that magical time of day when Chinook salmon bite the best. Be sure to have the bait in the water one half hour before sunrise. Fishing is most productive from ½ hour before sunrise to midmorning and from late afternoon until ½ hour after sunset. The most productive fishing for early returning fall Chinook salmon occurs trolling a plug cut herring with the incoming tide from the jetty jaws to the entrance to Bandon Marsh. The tidal reach of the Coquille River is the longest of any coastal river in Oregon extending upriver 41.01 miles from the jetty jaws. As the number of returning Chinook increase, fish upriver from the power lines down river from Rocky Point to the hole at Randolph Slough to the Cannery Hole above Randolph Island trolling a plug cut herring with the incoming tide through high tide. Launch at Riverton or Coquille and fish with the tide trolling a plug cut herring followed by trolling bait wrapped Flatfish lures, spinners or spinner bait combinations from Bear Creek which is located upstream from the Cannery Hole above Randolph Island to Sturdivant Park in the City of Coquille. The most effective Flatfish lure has a silver body and chartreuse head or Hot Tail finish. The most effective spinner is colored with 50/50 chartreuse and brass blade or a rainbow colored blade with a green tip. Drift with the outgoing tidal current back bouncing a walnut sized gob of salmon eggs topped with a sand shrimp or drift with the tidal current back bouncing a walnut sized gob of salmon eggs topped with a sand shrimp or drift with the tidal current using a free sliding bobber to fish a walnut sized gob of salmon eggs topped with sand shrimp suspended just off of the bottom. Anchor above the up current side of the deeper holes during the outgoing tide and fish on the bottom with bait wrapped Flatfish lures; bait sweetened Spin–N–Glos, wobblers or a walnut sized gob of salmon eggs topped with a sand shrimp. Accent the salmon eggs and sand shrimp with a small length of pink, red, chartreuse or orange yarn. Coho salmon return to the Coquille River from September through October. The best fishing occurs early in the run trolling plug cut herring, hoochies or streamer flies behind a wire spreader or a diver in the upper half of the water column with the incoming tide from the jetty jaws to the entrance to Bandon Marsh. Fish from the entrance of Bandon Marsh to the Highway 101 Bridge trolling plug cut herring, pink or chartreuse spinners. Fishing is allowed in tidewater for the retention of fin clipped coho salmon upstream to Lampa Creek at river mile 11.5. Prime steelhead fishing is available in the major forks of the Coquille River—namely the South, North and East forks. Hatchery steelhead smolts are acclimated and released in areas where angler access and harvest success is good. The South Fork of the Coquille River upstream of the Forest Service boundary is closed to all fishing to protect spawning and rearing steelhead. The South Fork is the largest of the three forks, and provides good access for boat and bank fishing. Steelhead smolts are released from acclimation sites at the mouth of Beaver and Woodward creeks below Powers, so adult steelhead are attracted back to these spots. The South Fork between Myrtle Point and Powers is a great area to target these returning fish. Drift boat launches are located at the mouth of Beaver Creek, at the confluence of the Middle and South forks, and several points in-between. Beaver Creek, Baker Creek, Myrtle Grove State Park and Powers Memorial State Park provide access to popular bank fishing holes. On the North and East forks of the Coquille River, most fishing is from the bank, although limited drift boating occurs in a few places. On the North Fork, the most popular steelhead holes are located in Laverne County Park. An acclimation site is located here, so hatchery returns to the area are plentiful. On the East Fork, acclimations occur near China Creek below Brewster Gorge, and excellent fishing is also available here. Land ownership along the East Fork is a “checkerboard” pattern, with alternating sections of private lands and BLM-administered public lands. The Middle Fork Coquille River has no hatchery steelhead releases. This river, characterized by boulder and “pocket water”, is a spawning and rearing area for wild steelhead. While their presence is very low, adipose fin-clipped steelhead are legal to harvest in the Middle Fork. There are a few public sites along the Middle Fork because most land is privately owned. Striped bass enter Coquille Bay from middle of March through April during the years when the striped bass population is at its highest. Most anglers concentrate fishing in Hatchet and Iowa Sloughs in the Riverton area and Randolph Island, Myrtle Point, and next to Johnson Mill Pond. Black rockfish and blue rockfish fishing is inconsistent at best. Striped seaperch, pileperch, redtail surfperch and walleye surfperch enter the bay in late spring. Schools of perch move onto the tidal flats feeding heavily on intertidal animals upstream from the jetty channel at the entrance to the bay into Bandon Marsh. The fishing ranges from fair to excellent through fall depending on the tides and the weather conditions. WIN CASH & PRIZES FOR CATCHING FISH! One lucky fisherman won 465 dollars by entering a 2.71lb redtail surfperch in the Crab Shack's annual Perch Derby. All throughout the Month of May, catch the largest surf perch in Bandon to win cash and prizes. Fish for perch along the jetty channel and from the public fishing pier or among the pilings associated with the Port of Bandon. Fish in the tidal flats adjacent to the tidal flats associated with Bandon Marsh as the perch migrate into Bandon Marsh on the tide. Kelp greenling, whitespotted greenling and rock greenling enter the bay with the tide. The best fishing occurs during the spring and the fall along the south jetty and among the structure associated with the public docks at the Port of Bandon. The fishing is poor the rest of the year. Lingcod spawn along the jetty from late January throughout March but the fishing is rated as inconsistent as best. Cabezon are present all year among the rocks along the jetty but the fishing is rated as inconsistent at best. White sturgeon enter Coquille Bay in small numbers from December to June. The sturgeon fishery is a small one that is of interest to local anglers only with the catch ranking 11th among Oregon’s larger bays. Fish for sturgeon upstream from the Highway 101 Bridge in the deeper holes of tidewater. The best fishing is at Rocky Point. The hole at Rocky Point is accessible to bank fishermen, but the most successful fishing is from a boat. Bank fishing for bass, lingcod, cabezon and greenling is limited to the north jetty, the south jetty and to the pier structure associated with the Port of Bandon. Fish for perch from the jetties and from along the west shore of Bandon Marsh. Fish for sturgeon from Rocky Point, which is located west of Highway 101 via the north bank road. The Port of Bandon Public Fishing Pier is located in old town next to the boat launch. The crabbing is good during periods of low rainfall. The fishing for perch is good from late spring through fall. Coquille Bay Jetties – Access to the north jetty is through Bullards State Park. Access to the Curry County Park at the south jetty is through Old Town Bandon. The jetty channel is deeper along the south jetty. Fishing for bass at night for bass along the jetty channel should be productive. Fishing for perch along the jetty channel is excellent. 262.1 Old Town Bandon is one of the most picturesque port towns along the Oregon Coast. Access to the Port of Bandon, the south jetty and the Beach Loop Road is through Old Town Bandon. Bandon State Park is comprised of three separate waysides providing access to Coquille Point, Gravel Point and Bandon Beach. Bandon Beach offers fair fishing for redtail surfperch. 288.1 Floras Lake County Park and New River Beach are located above Cape Blanco. New River Beach is an excellent location to fish for redtail surfperch. Chinook salmon, usually the four year old fish, return to Floras Creek and the New River from late October peaking in November into December. A small number of coho salmon return in October. Steelhead fishing in Floras Creek. Floras Creek muddies quickly, clears slowly, and has an excellent steelhead run. Bank is very limited. Boat access is very limited and mostly on private lands. 293.6 Airport Road is the Oregon Coast trailhead to Cape Blanco or to Lake Floras and the New River Beach. The fishing for redtail surfperch is excellent. 295.7 Sixes River and the Sixes River Beach and Estuary are located just above Cape Blanco. Sixes River Beach at the estuary is listed by ODFW as a location to dig for razor clams. The beach is renowned as an excellent location to fish for redtail surfperch. Access to the Sixes River Estuary is through Cape Blanco State Park via the Hughes House access road but access to the rest of the river is limited by private property. A small number of coho salmon return in October. Chinook salmon, usually the larger five year old fish, return to the Sixes River from late October peaking in November into December. Some anglers drift the Sixes River from the Sixes River store on Highway 101 to Sixes River Estuary at Cape Blanco State Park. Other anglers prefer the longer drift from the Mid–Drift launch further up river to the take out at the Sixes River store. Drift the Sixes River when height of the river gage of the Elk River measures between 5 and 7 feet. The Chinook salmon that return to small coastal rivers are generally dominated by 4 year old fish followed by 5 year old fish. When large fish are caught in these small coastal streams they attract a lot of attention and easily becoming overcrowded with anglers. There is a measure of truth in the axiom, “Too many cooks spoil the broth”, especially when too many anglers target the same fish in small water. If you can deal with the crowded conditions the reward can be worth the effort. Annually an average of 3000 Chinook return to the Sixes River. The average catch rate for the Sixes river is 600 fish per year. The BLM operates the Sixes River Campground. 296.6 Cape Blanco is the westernmost coastal point of California, Oregon or Washington. Cape Blanco offers an exceptional opportunity to observe gray whales. The view from the cape is absolutely magnificent. The lighthouse, which was built in 1870, was the second lighthouse built on the Oregon Coast. The black sand beach is a unique geological feature that attracts thousands of visitors each year. The park is the site of the historical Hughes House which was built in 1898 and displays period furniture depicting the lifestyle of the times. Antonio Flores named Cape Blanco in 1603. Cape Blanco has a full service State Park and equestrians are welcome. 297.2 McKenzie River Beach and the Elk River are located below Cape Blanco. The beach is an excellent location to fish for redtail surfperch especially at the mouth to the Elk River. Motor vehicles are allowed on the beach at Elk River State Park south to and area below Port Orford. A small number of coho salmon return to the Elk River during late October or early November. Chinook salmon, usually the four year old fish, return to the Elk River from late October peaking in November into December. The catch rate over the last decade has averaged 930 Chinook per year. Anglers avoid the Elk River estuary during high tide, because the Elk River estuary is subject to flooding by ocean waves during high tides. Access to the estuary is over the beach with 4 wheel drive vehicles with oversized tires. Most anglers drift the Elk River from the Elk River Fish Hatchery to Ironhead Landing, which is located east of Highway 101. Access to most of the river is limited by private property. Drift the river when the height of the river is between 5 and 7 feet. Information Report 2001-07 Estimating Run Size and Spawner Escapement of Chinook Salmon in Elk River, Curry County,for use as an Exploitation Rate Indicator for Mid Coastal Wild Chinook Stocks. Steelhead fishing in the Elk River. Elk River is slow to muddy during rain events, and clears quickly. It has an excellent steelhead run that is best fished from a boat. Elk River does not have a steelhead hatchery program, but anglers can expect to catch some stray adipose fin-clipped steelhead. Elk River fishes best at 5.0 feet and dropping. Anglers can call (541)332-0405 for daily gauge heights and water clarity. Limited bank fishing is available because the majority of land along the river is private property. Most drift boaters put in at Elk River Hatchery and float approximately nine miles to Ironhead boat ramp; both are ODFW properties. Boat anglers side drift eggs, fly fish or run plugs. Chinook are in the system thru February, so anglers may want to run a little heavier line. Recent improvements at the Ironhead boat ramp offer better boat launching and retrieval, and better bank fishing opportunities. Please park only in the parking lot, pack out all garbage and respect adjacent property owners. Steelhead fishing in the Sixes River. Sixes River muddies quickly, clears slowly, and boasts an excellent steelhead run. Bank fishing and boat access are at Cape Blanco State Park, Hwy 101 bridge, and at ODFW and BLM properties. Boat anglers can find easy floats that range from two to 12 miles. Most anglers fish roe, spinners, run plugs or fly fish. 299.8 Paradise Point State Wayside is the beach access to Paradise Point and to Garrison Lake. Fish for shallow water rockfish, i.e. grass, brown, copper, black or blue rockfish and sea trout, perch, cabezon and lingcod associated with the rocky shore from Paradise Point to Battle Rock at Port Orford. Crabbing on 07/19/15: after receiving reports of excellent of crabs being taken from Webber's crabbing dock I could not resist visiting there today. I was Unable to take any legal sized crabs during the 3 hours I spent crabbing from the dock. The crabber next to me said him and his family took 22 crabs last Thursday. Even though I did not take home any crabs it was a great day. On 07/01 Tony from Tony's Crab Shack kicked off his annual Crab Derby. Catch a tagged crab and you are on your way. The Crab Derby runs from 07/01 through 09/10 amid all the excitement of Bandon's Annual Cranberry Festival. Click on the image several times to enlarge and view the brochure.